A second Labour candidate standing in the Brighton and Hove City Council elections has been suspended from the party over social media posts. But despite the suspension, the local party's campaign forum said it is 'focused on fighting to secure a Labour majority at the city council come May 2nd'. Daniel Gray, a teacher from Brighton, was standing in St Peter's & North Laine for the Labour Party. But a national newspaper revealed 'sexist tweets' on his social media accounts which led to his suspension this weekend. He has since apologised for the tweets. Now a second Labour candidate, Alex Braithwaite standing in Wish ward, has been suspended from the party. It is understood the suspension is in connection with posts on social media. A Labour Party spokesperson said: “Individuals who are suspended from the party can’t stand as party candidates. Due to electoral laws, those who are suspended after the deadline can’t be removed from the register, but they are not party candidates." They added that the Labour Party takes complaints about its members 'extremely seriously'. "We can’t comment on individual cases,” the party spokesperson said. Mr Gray said: "I am deeply and sincerely sorry for these unacceptable and sexist tweets. These tweets absolutely do not reflect my views. “This was a very dark time for me, and these tweets were an outlet for my own sadness. I don't remember posting all of these comments. I am mortified by them and ashamed of them and I wholeheartedly apologise. “I care very much about educating myself, championing women and LGBT+ rights and helping to create a more equal society that is free of prejudice and bigotry. 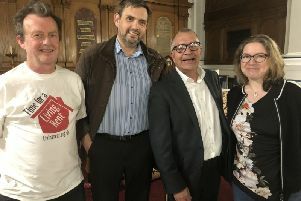 A statement from Brighton and Hove Labour's Local Campaign Forum said: “We do not comment on internal Labour Party investigations. "We remain focused on fighting to secure a Labour majority at the city council come May 2nd. "The party in the city is in high spirits. Members are pouring out unto the streets campaigning every evening. "We have also been buoyed by John McDonnell’s encouraging words of support for our radical manifesto that promises to fight back against the effects of Tory austerity, make this city carbon neutral in 10 years, build 800 council homes, make our city a beacon of ethical employment practices, protect our NHS and hold rogue landlords accountable, among other things. Ms Braithwaite has been contacted for a comment.